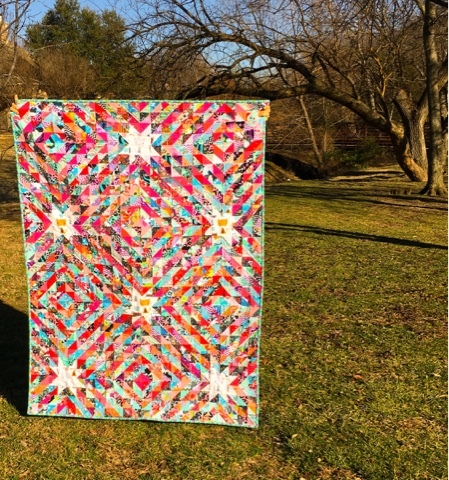 This, my friends, is the Gratitude Quilt. 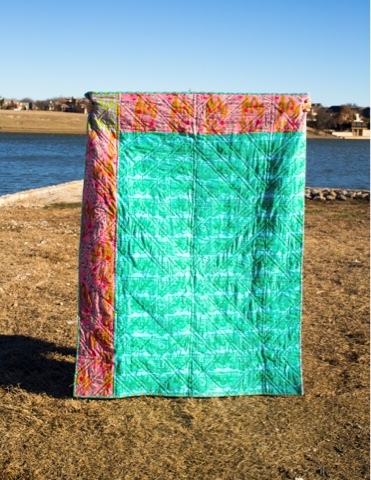 Everything about the quilt and the season that it was made in screamed "Be Grateful!" So, no other name fit it. I mentioned in my previous blog posts that I had a difficult 2016 and hopefully would be able to write more about it in the coming year. Last year I lost two pregnancies, one of them being a molar pregnancy. I also got sepsis from the surgery to remove the molar tissue. Sepsis is so awful because it affects your ability to even tell the loved ones around you that you aren't well. My thoughts were not quite going together and my strength was waning more and more each day. After two and a half weeks (which included 2 OB visits), finally, an ER doc identified the problem and admitted me. I had 4 days in the step up ICU, and then, I got to go home since the sepsis had not damaged any of my organs and I was back to functioning. Praise God! When I got home and was happy and glad to be alive, I kissed my kids and hubby extra hard, did some laundry, and then, pulled out my tote of flannel scraps and some quilt blocks that I had previously started. The scraps I pulled out were the tiny ones I normally would throw away. For some reason, I had put all these tiny bits and pieces to the side and in the garage. (As long as it is neatly in a tote, it is not hoarding, right?) 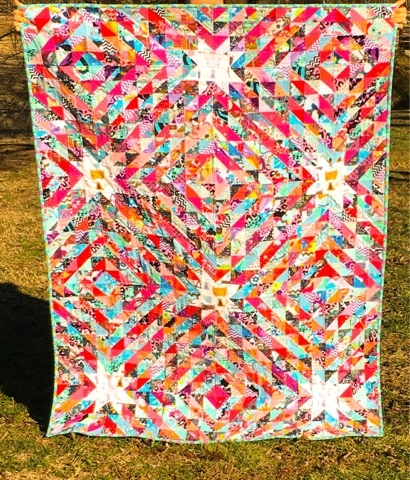 I put each tiny piece through my Accuquilt die cutter for a two and a half inch half square triangle. The ones that were smaller than this did get thrown away, and at the end of it, I had most of the tote cleared out. I would love to write that everything was perfect once I got home from the hospital. I love happy endings. The Bible says that all things work together for the good of those who love God and are called according to his purposes (Romans 8:28), but things, so far were not "good." Once I arrived home, I got the call that they discovered while I was in the hospital that the molar pregnancy tissue was still growing and that I needed to continue care under an oncologist. Yikes! The oncologist wanted to start chemotherapy treatment or do a hysterectomy. My pastor says that "it is not over until you are satisfied" and to never accept the words of other people (who are not God) as final in any situation. I decided not to do a hysterectomy or chemo. Instead, I began praying and seeing an acupuncturist, who drastically changed my diet, gave me tons of herbs, and spoke to me about getting to the root of the issue. The oncologist continued to do bloodwork every week and met with me on a regular basis. I had some weeks where things improved and others weeks where they got worse. It was four and a half months of a roller coaster. But, I was trusting that God was my healer and had peace in my heart about the path I had chosen. Ephesians 6:13 says "Therefore put on the full armor of God, so that when the day of evil comes, you may be able to stand your ground, and after you have done everything, to stand." This was for sure a season of evil, and I was determined, like a bull dog, to stand. The breakthrough did not come through me being perfect, my emotions being perfect, or through some ten step process that I completed. Rather, the day that everything turned around in my favor, was the day I made a choice to praise God. 1 Thessalonians 5:18 (AMP) says that "in every situation [no matter what the circumstances] be thankful and continually give thanks to God; for this is the will of God for you in Christ Jesus." There is something that happens when you praise God that changes you and lets God act in your life. I had done all I could do. I had prayed all the prayers I could. There was nothing left for me to do than give up. BUT I was sitting in church, and the pastor was talking about praising God and how it can be the determining factor in a situation. It didn't dawn on me at that moment, but his words just flooded my heart on a Tuesday morning while I was cleaning the kitchen. I just started telling God how grateful I was and all the words of gratitude just poured out of my heart. After that day, I never got a call that my tumor marker was rising. And two weeks later, it was over. Typing this out was hard. I am normally not so raw, but I felt that I needed to show the difference praise can make in that thing you are believing God for. Praise him like He has done what you asked him to do. If you believe He heard you when you prayed, stop asking Him about it, and begin praising Him for it now. Praise Him that He is the answer. Praise Him that you don't have to know everything (what a relief!). Look around your life and find something that you can genuinely tell Him you are grateful for. Don't get so caught up in looking towards the future and what you want to happen that you forget to see what is right in front of you now. And of course, I have to show you the back. This quilt is super soft and cuddly because it is all flannel. 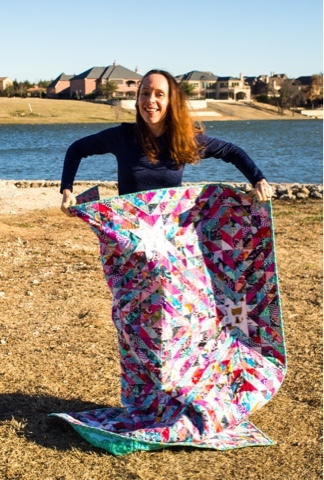 Also, I have to show you how fun it is to hold quilts up in the wind. Photo Credit: My dear friend Aimee of Capture, Cook, and Craft.